How many steps do your floor managers take going back and forth to the computer and print stations in the plant as they do their jobs? How much time does all that walking take over a year’s time? How much more work could be done if computers and printers could go where they do? If you’re managing materials going to and from storage, all that travel time is taking valuable people assets away from what should be their primary function. Whether working in receiving, cross docking, put away, returns, picking or shipping, a mobile workstation can save you thousands in labor costs while bringing in additional profits from the added throughput gained just because your workers aren’t traveling back and forth from computer and printer to the stock areas. 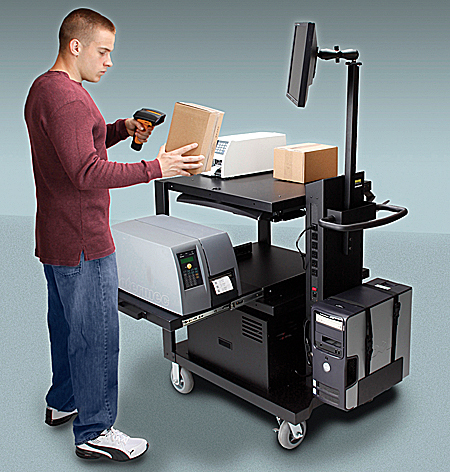 Moving the computer systems to mobile carts with power supplies on-board means your workers can do paperwork on the fly. Process order fulfillment in the aisles and tie it all back into a wireless central warehouse management process without adding special software or programs. You use what you’ve always used, but now you can take the system with you. When you convert a stationary workstation into a mobile system you allow your workers to go wireless as they move through the facility accessing data in real-time right at the site where a concern rises or questions come up. Workers experience less frustration because they have immediate access to company systems and can respond to issues quickly. Because workers reduce time retrieving data, they get more actual work done. Each mobile workstation is configured to your custom needs. You choose what equipment goes on the cart and how much power is needed. The carts already have multiple AC outlets built-in, shelves for equipment and optional accessories to organize and hold everything from the CPU and monitor to pens, scissors and even bar-code scanners. Most carts also have a power supply in the form of a battery pack that sits on the bottom shelf and feeds AC power to your equipment on-board. Carts can be set up for order picking, receiving, shipping, and more. The battery packs are rechargeable and deliver 4 – 8 hours of power depending on the types of equipment you’re supplying power to. Many carts are set up for swapping out battery packs as needed so that your mobile systems never need to be in “dry dock”, recharging. A smaller cart with single equipment shelf and battery pack. 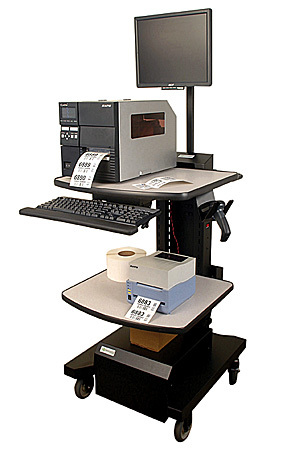 Useful for shipping, receiving, shelf labeling, even point-of-sale in retail, and general retail material handling data chores. Many options available to customize use. A medium sized cart with multiple shelf options, slim profile for ease in moving through crowded aisles. Can power multiple computers or printers. Many options available to customize use. 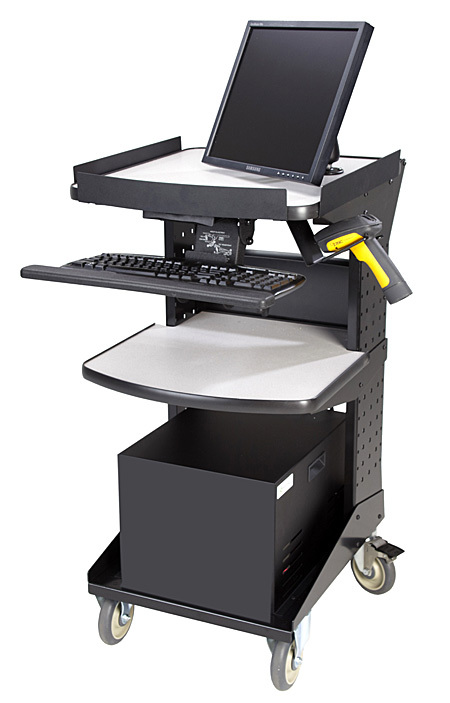 A heavy-duty cart with multiple shelves, large capacity battery pack and numerous outlets for equipment to plug into. 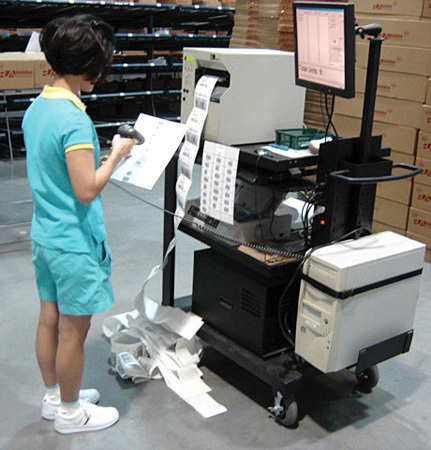 Great for inventory control, picking, shipping and receiving tasks. Many options available to customize use. We can help you find the right solution to deliver functionality for computers, printers and more to your warehouse or manufacturing facility. Contact us for assistance.